I say 'explaining' because I reckon the effect of vortex generators on aircraft wings was one of those innovations that was 'discovered' first and explained later. Somewhat like the developement of dimples in golf balls. As I understand it, this came from golfers out on the fairways noticing that well-worn and battered golf balls went farther and truer than the new smooth ones of the day. Then the manufacturers did wind tunnel experiments to determine the best dimpled surface, and finally boffins applied aerodynamic theory to explain what was happening. It's trully fascinating how such small devices can have such a dramatic effect on the aerodynamics of any wing! They aren't just a 'fix' for a sub-standard wing - they're an aerodynamic enhancement in their own right! I won't try to explain the theory of how vortex generators do what they do - instead I'll refer you to an article already published that does it better than any I've found. Have a read of 'Vortex Generators: Band-Aids or Magic' by Mike Busch on AVweb. Scroll down to the section "How VGs Work". This is an effect that I've noticed by experience with video tuft testing VGs in action. This is a distinctly different effect from the commonly presented ".....retaining the boundary layer...."
In the first video you can see the tufts becoming slightly unstable as the angle of attack increases, then when a stall starts near the root it suddenly 'flashes' out to the rest of the wing, except the outer portion which has VGs applied. In the second video with VGs along the entire wing, you can see the stall start at the root, then it just advances and retreats hesitantly, never spreading suddenly. And all at a much higher angle of attack than the first video. The higher angle of attack is due to retaining the boundary layer, but the control of the spread of the stall is due to the 'Rip Stop' effect. I call this the 'Rip Stop' effect as an analagy to nylon fabric. You'll note that when thin nylon fabric starts to tear, the rip will just zip right across the fabric very easily. So manufacturers add stronger threads about every 6mm, so that they'll stop the rip from progressing. That appears to be exactly what the VGs do to a spreading stall disruption. The vortexes seem to 'tie' the aiflow together like the stronger 'rip stop' threads, so that it stays in a coherent 'sheet flow', well attached to the wing surface, rather than allowing a stall disturbance to spread. It's also important to point out that VGs don't improve a wing. They just improve the airflow over that wing. This 'Rip Stop' effect with the VGs, turns the stall from a sudden event that drops a wing, to a progressive event that just becomes gentle 'mush'. That makes slow landings a lot more controllable and less risky. The following photograph demonstrates the persistence of the vortexes generated by VGs. Notice that they track all the way back to the trailing edge, and stay tight to the surface of the wing. That wing has a layer of chalky unpolished paint, and the vortexes appear to cling so closely that they actually clean the surface. 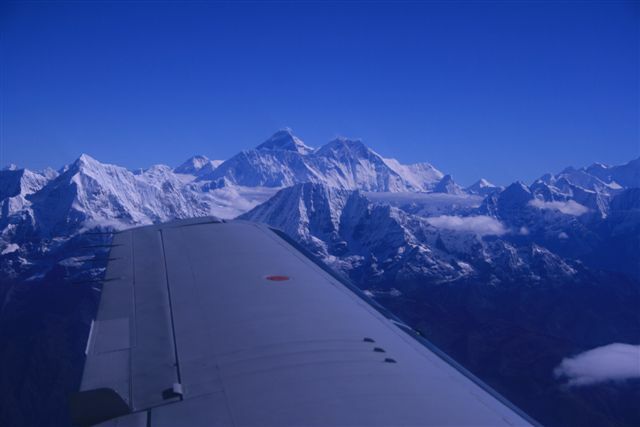 The wing is on a Jetstream 41, and that's Mt Everest !